HOUGHTON — In January, an eco-friendly vintage snowmobile was placed on the frozen Portage Canal by the Rotary Club of Houghton, a press release from the group states. 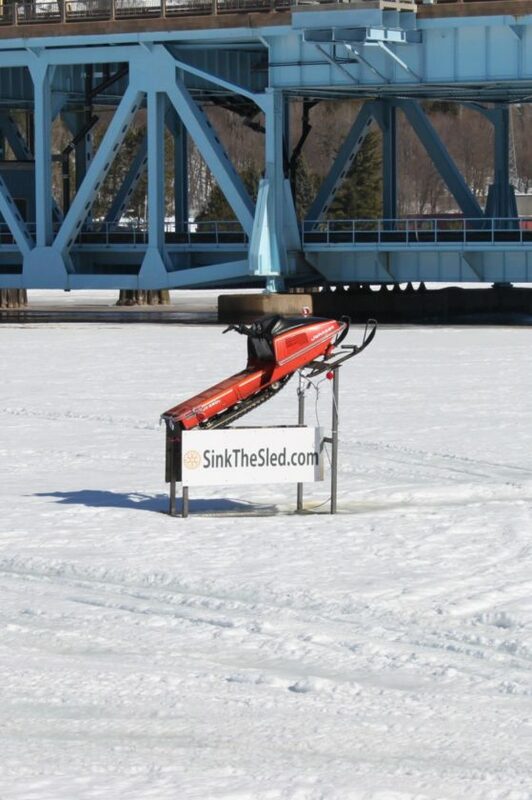 The person who predicts closest to the date, hour and minute the sled falls through the ice will win up to $1,000. Contest proceeds benefit Houghton Rotary’s high school scholarship fund. Guesses can be purchased online at SinkTheSled.com for $3 each, or $5 for two guesses. Complete contest details and a live webcam can be found on the website. The grand prize winner will be determined by a time-stamped webcam video and all entries must be submitted before the sled falls through the ice. Houghton Rotarians made sure the sled was eco-friendly before it was placed on the ice, the release states. The sled was stripped of its gas tank, engine, clutch, belts and seat and steam-cleaned; and after it sinks it will be removed from the water.